Taking care of an animal is, for some, a way of fighting loneliness. Others take on a pet as a means of adding some joy and excitement to their life, while for a parent, a pet is often a way of teaching kids to love animals. No matter what reasons you have for getting a pet, a dog, especially a Labrador, is an option that should not be overlooked. Gentle, sociable and easy to take care of, Labradors originate from Newfoundland, Canada, where fishermen used them to recover the nets from the waters. Imported to England at the beginning of the 19th century, Labradors arrived in America during the First World War. 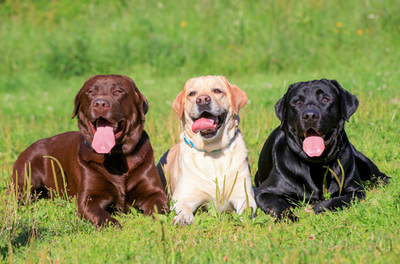 Their thick and dense water resistant coat can be black, chocolate, brown as well as light beige and even white. It is easy to maintain as it only needs brushing once in two weeks. Labradors shred usually twice a year. This breed can reach about 22 inches in shoulders and a weight of 55 – 80 pounds. Labradors are very sociable and warm with humans, especially with kids. Energetic and playful dogs, who love to move and run all the time, Labradors are suitable pets for large families with children. They like very much to swim or at least play in the water, probably because of their roots as retriever dogs. Their openness to humans does not make them very good guard dogs, though. They will not be aggressive to intruders, but they might just be good at alerting the owner that a stranger is in the area. Because of their sharp senses, Labradors are often used as guiding dogs for blind people, as service dogs for disabled persons or as custom dogs. They want to feel loved and will make anything to please their owners. This is what makes them easy to train and raise. Another advantage is that Labradors have very few health issues. Therefore, they will not require a high amount of money to be spent on their healthcare. Still, the breed has a predisposition towards hip dysplasia and they should be frequently checked for this disease that causes the deterioration of joints. They also like eating a lot and risk becoming overweight, which leads to other disorders like diabetes or arthritis.